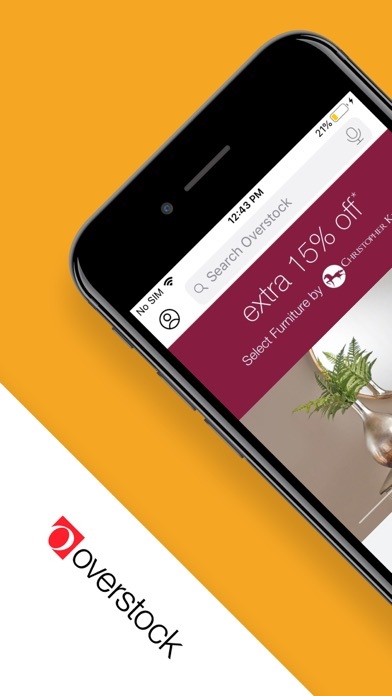 As a 7-time award winner for Best Retail Mobile Application, the Overstock app is the perfect way to shop the best deals on stylish furniture, decor, area rugs, and more for your home. 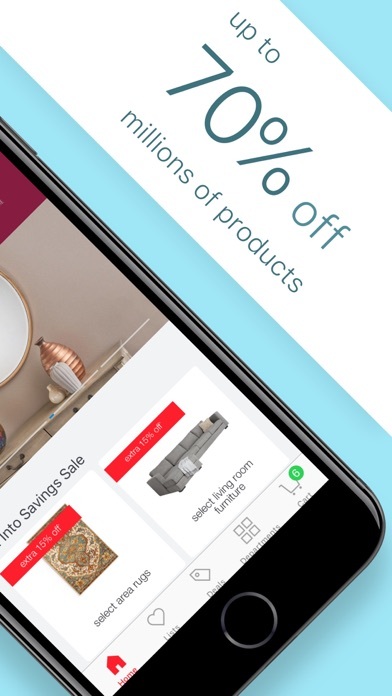 The Overstock shopping app makes it quick and easy to transform the look of your home for less. Explore our huge selection of the hottest home decor, furniture, area rugs, mattresses, bedding, jewelry, and more to find just what you want at prices you'll love. When you shop on the app, you'll find deals of up to 70% off and you'll get FREE SHIPPING on every order of $45* or more! Make an account today to get 10% off your first purchase! 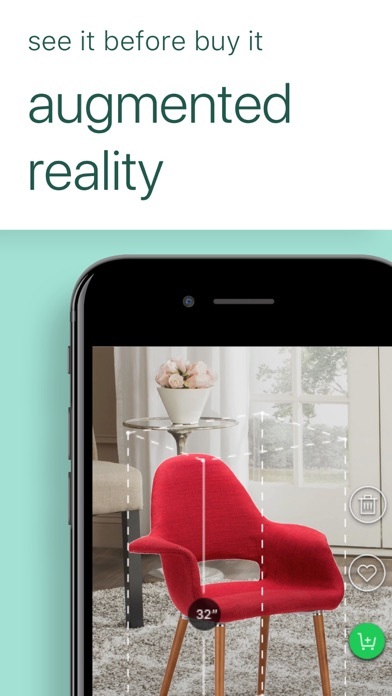 Download the Overstock app now to: -	Use augmented reality (AR) to visualize how furniture looks in your home -	Get app-exclusive coupons and deals every day -	Checkout quickly and securely with Apple Pay -	Receive notifications for daily deals and order updates -	Shop with your Club O account and earn 5% rewards on every purchase -	Save items and create lists of favorites to personalize your shopping experience -	Chat with our award-winning customer service agents -	Log in with Touch ID Overstock.com is one of the leaders in online home goods, featuring a huge range of products at the lowest prices, including furniture, decor, rugs, bedding, home improvement, jewelry, and more. The site is visited by nearly 40 million customers a month and provides access to millions of products. *Free standard shipping on orders $45 and up (applies to U.S. orders only. For expedited shipping, additional charges will apply. Offer applies to the lower 48 states. Offer excludes Alaska, Hawaii, APO/FPO and international orders. Sales tax and charitable donations are excluded from subtotal for purposes of this offer). Although the app does require certain permissions, we will NOT have access to your personal information and we do NOT track or collect any information from other apps. 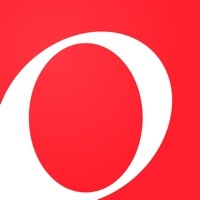 are use the Overstock app. I like the merchandise, the shipping and the prices are generally good. However, I do not see any customer service chat function or 800 number to call for questions regarding merchandise. I also would like to know if merchandise I’m contemplating purchasing will be on sale further on Spring Black Friday which starts, when??. Overstock keeps up! O has the latest tech, easy tap access to its online departments, and lots of views for each product. I like the honest reviews too. What’s an issue for one customer may not be one for me, for example. And when there is a problem, O, customers report, fixes it. (I hope that continues to be true!😇 Response time and shipping info comes to my email in a timely manner too! What could be better? Well, when I scroll product info sites, there are many repeats! Very annoying. Just show us the product once as I scroll though a site. Thanks. ‘Hope you make that improvement. Overall tip of the hat to the tech crew and the crew that chooses the variety of goods on the Overstock site. I hope they give you a good salary with great benefits. Oh, and stretch breaks too! 🎩 👑 🍀! Never again I’m having a refund today for a coffee table a bought the 2nd of April with back and forwards. Love the higher quality items at lower prices! Disappointed. Placed an order and then realized an error in the color of one of the two tables ordered. Contacting customer service was not easy. When I finally was able to connect with someone in their live chat, he told me there was nothing he could do to fix the error. He said he could try sending a message to someone in charge and then he disconnected. I ordered two glass tables to put in front of my sofa. Really excited for them to arrive. Will review again once they arrive. Order process was very easy. Great quality for a great price with great service! Like I said, I love Overstock! Love love love the site. You can find any and everything your looking for and the prices are amazing. Needs option to turn off haptics. Please advise how to adjust frequent, opt out or unsubscribe from from receiving So many emails. Putting together with my son & daughter-in-law took half a day even with good directions to put together. I’m glad we bought it, it’s a beautiful set. Now would like a matching buffet or sideboard. I don’t much , I shop at Overstock because I search for unique , quality merchandise that is value priced . Not everything here is value priced , but there are items that are . When I come across an item that fits the above mentioned template , I purchase it . You will always find something at Overstock that you can use . Yes , I’ve been a loyal Overstock customer for over 10 years . Overstock I just love it . They have the best customer service ever . they have the best stuff ever.that last for years and years I have shopped with them for a long time . And I will keep on shopping . I have told many of my friends and family about Overstock. Com and how great there stuff is and service is and I will continue to shop there and so will they . To have great quality goods and great customer service gets a 100 in my book Thank you Overstock you are the BEST !!! I’ve purchased A LOT from O & have been happy with 99% of purchases. Good app but pretty much every time I leave it to respond to a text or something and come back to it the app refreshes and I lose my place. If it didn’t do that I would give it 5 stars. It’s easier just to browse online. If you want to get out of the app for a second, when you go back into it to continue looking at what you were looking at, you have to start all over again. I tried to go into the app settings to change it, and they have the “background app refresh” on, and they don’t allow you to turn it off. It’s extremely frustrating. I haven’t bought anything from Overstock yet, so I can’t comment on them as a company. I just hate their app. Overstock has the slowest shipping I have ever experienced. The last few purchases I have made have taken about a full week of “processing” and then they ship items that take about 2 weeks to arrive. I know it’s not Amazon and their 2 day shipping, but 3 weeks is horrible. They offered me a free Overstock Club O, for being a college student. It’s still not worth it. I don’t want to wait 3+ weeks for simple items. Overstock has it all, great prices, selection, and prompt shipping. I am sold! I really like the functionality, the clean design, and of course they have a huge amount of choices for a customer to choose from. I am very thankful to hear that you ship to Alaska. Finally I can now order from your site! Just love the furniture the comforter sets... Off course no woman can go without Jewelry too... I just love OVERSTOCK!!! Overall, the app is decently designed. However, while using it to check on my order and track its delivery, the app inexplicably prompts me to try the app. Also, while shopping for items with numerous options, like sheets, I must reapply the filters if I deliberately navigate away from the app to take a call or reply to a text, or if I just accidentally touch one of the menu categories along the bottom of the screening while scrolling through results. CSR’s are too lazy to follow through with the simplest request through chat or phone. They lie repeatedly over something as easy as an email preference issue. Things that wouldn’t happen as often if they had to actually look at people in person. Have fun wasting your lives staring into a screen, with completely meaningless work. I love Overstock, great products, good prices, and most importantly...excellent customer service. If you are looking for something ordinary, unique, or handmade, this is a great sight. I have gotten all of the above some, at exceptional prices, some not, but sometimes quality is my priority. First time purchase. Great transaction. Fast delivery. Just as pictured. Will by from again. 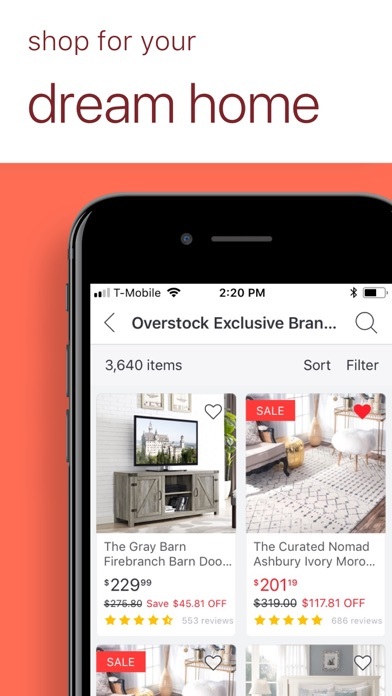 I’ve been unable to update the Overstock app all day today (3/19)19). I like your app but I need to know what bug is causing the problem with updating it. Thank you. Very easy to order on time delivery. Just super convenient. I filter to find products and then open something else on my phone and leave the app running in the background. When I go back to the app, it reloads and goes back to the homepage, which means I have to start over again each time. 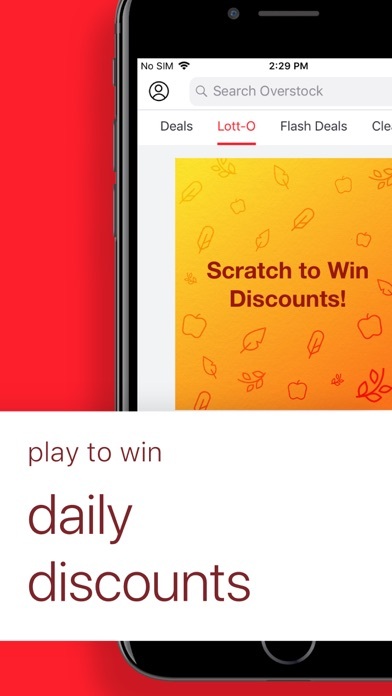 Other shopping apps do not do this. I also feel that not all options are shown in the app- easier to search the website through the phone browser than the app. The quality of the product has is as expected. Also, the customer services is excellent. I absolutely love Overstock! This is my go to place no matter what I’m looking for. I can find any shape, size or color. Highly recommend this website. Me gusta mucho porque compro cosas que no la hay en otras tiendas y cuando las veo en otras tiendas es mucho más caro .